Enjoy beautiful cottage style in the classic Bolanburg dining room counter table. 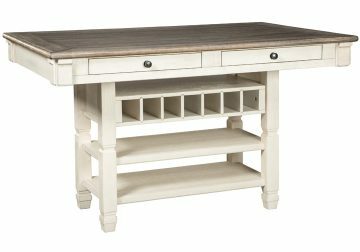 With a rustic planked top and six convenient drawers, this table serves up casual with a vintage twist. The gently distressed tabletop creates the perfect spot for an impromptu gathering, with no need to head to the linen closet for extra place settings. Keep placemats, napkins and utensils on hand in the table’s four built-in drawers—very practical for any living space. Dine in the comfort and rustic charm of the unique Bolanburg bar stool with rake-back design. The cushioned seat, upholstered in a heavy woven fabric, is the perfect place to sit and linger. 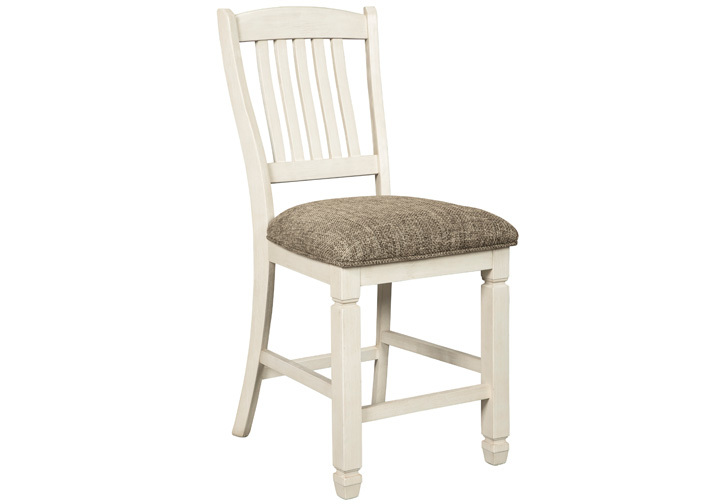 Textured antique white finish serves up a vintage look with ease. 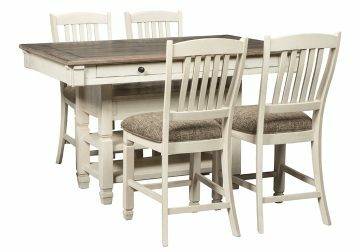 The Bolanburg Dining Series by Ashley features unique two-tone finish with a combination of Oak and Acacia substrates combining a trendy textured antique white color with table and server tops finished in a textural weathered oak finish. Rectangular dining table features six convenient drawers for storing smaller items. The -02 upholstered host chair inspired by the trendy deconstructed styles for casual living. The -01 side chairs feature a boxed cushion seat. All chairs feature a heavy woven fabric for added textural qualities. The large capacity server has three doors with lattice design. The tall bunching unit has two drawers, three shelves and open lattice sides. D647-32 rectangular counter table features four convenient drawers for storing smaller items. All chairs feature a heavy woven fabric for added textural qualities. D647-13 round drop leaf counter table converts to smaller square version and has a shelf for storage.